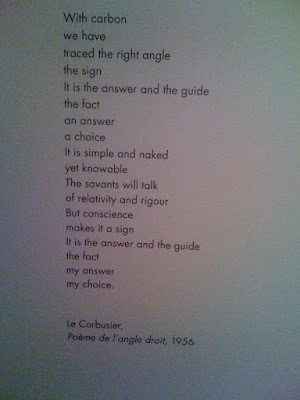 Seen and snapped at the Corbusier exhibition at the Barbican yesterday afternoon. Same thing happens in Alphaville, when Lemmy Caution is being interrogated by Alpha 60. According to the English subtitles on the Criterion DVD: “What is your religion?” “I believe in the inspirations of conscience.” I tend to think that the proposition of conscience as something to be inspired is worth the translation loss. I’m sorry, but doesn’t fr. conscience mean both en. consciousness and conscience? In the event, in both cases I would opt for the latter translation. Yes that’s it… That’s what my friend was saying. He just thinks that it should be the former, not the latter, given that it’s Corbusier we’re dealing with. Generally when you see either Conscience or Consciousness in an English translation of a French work, it means that the translator has had to make a choice. Unless it’s like “esprit,” which is a whole nother ballgame. Yeah, that’s a good example….